Finally, it’s clear that people – US Americans, at least – have come to like not just “chile pepper” and “hot” food, but certain chile pepper flavors. The USA may have brought the world much of the current junk food that only pretends at being flavorful thanks to flavorings that are added in the production and preparation, but the USA also has a bit of a tradition with distinct types of chile peppers thanks to New Mexico and its Anaheim peppers (and others, and the proximity to Mexico). … which is actually not a type of pepper, but a preparation of jalapeño. And jalapeño, in turn, is what this is all about. Jalapeños, thanks to their not-too-bad pungency, juicy flesh, and distinct aroma, have become an ubiquitous chile pepper. Go to a supermarket, even here in Europe, and as long as there is any kind of “Mexican food” section, you will be able to find a jar or can of hot peppers. It may not say it, but they are more than likely to be jalapeños. 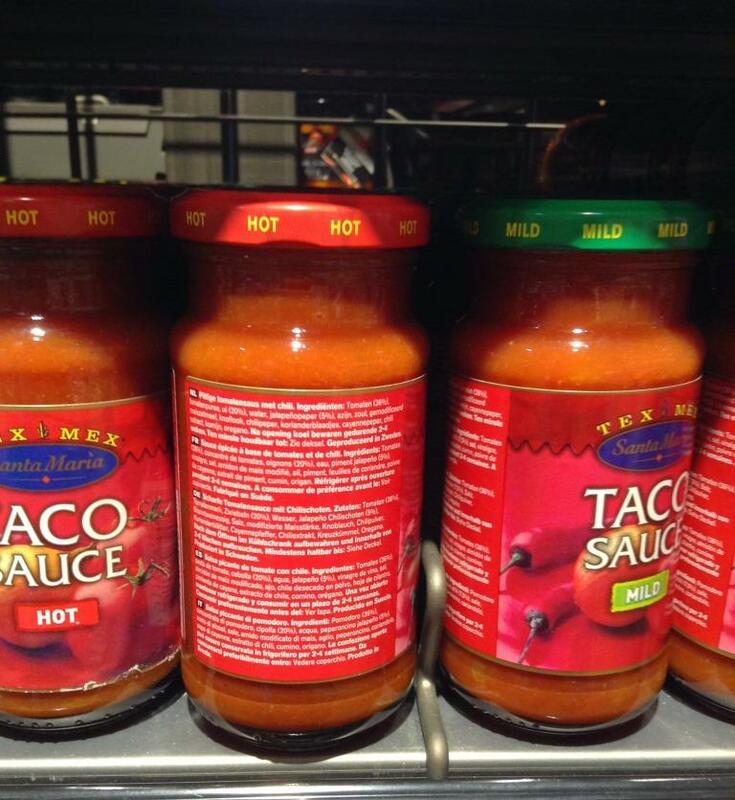 “Mexican” sauce or salsa? Probably also with jalapeños. What gets me talking about them now? I only just recently sang the praises of the jalapeño, recommending them as the type to try if one wants to get into the world of chile peppers but isn’t used to high pungency yet (which also typically comes with not wanting a chile pepper that is thin-skinned and therefore mainly delivers heat). But now that Americans have become more used to jalapeños and hot eating, apparently they want it hotter – but still with the jalapeño flavor that has become comfortable in all its ubiquity. Frankly, I don’t quite know what to make of that. On the one hand, it is only natural that plant breeding will progress hand-in-hand with the preferences of eaters. Through breeding, we made apples sweeter, brassicas less bitter, tomatoes a fifth aggregate state of water (round, red, solid, tasteless)… The bell peppers, according to at least one story, came out of a Central European desire for non-pungent chile peppers, which made Hungarian pepper breeders notice when they found a fitting strain of larger-fruited and totally mild chiles. And so it went. On the other hand, however, I can’t shake the feeling that “the market” is a tad crazy. There is such a great diversity of chile peppers, many of them with the desired higher heat, and also with different interesting flavors and different pungency profiles, I don’t see why we should stick to one kind of flavor and demand higher heat with just that flavor when there would be a whole world of flavors to discover. Leave the jalapeño the great introduction to ‘hotter’ eating that it is and check all the hundreds of further varieties that are out there. Fortunately, the two approaches aren’t really exclusive – but a bit more adventurous a taste that, having started with jalapeños, also explores what else is out there is really, ‘hotly,’ recommended!